Purse seine fishing is a consistent and efficient method, enabling fishers to catch and freeze large quantities of tuna. Purse seine vessels fish either by spotting free-swimming schools of tuna or by utilizing floating objects that attract fish, either with natural or manmade objects such as fish aggregating devices (FADs). 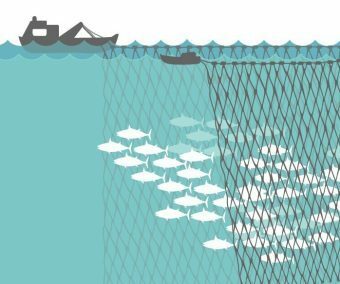 When fishing on free-swimming schools, purse seine fishing has an average bycatch rate of less than 1 percent. When utilizing FADs, bycatch rates vary from around 1.75 percent in the western and central Pacific to nearly 8.9 percent, depending on the ocean region. According to an ISSF-commissioned study, purse seine vessels consume 368 liters of fuel in order to land one ton of tuna.